Ideal for homes with space at their sides or where the rear garden does not lend itself to an extension of the property, an aluminium lean to conservatory provides a superb addition which allows light and sunshine to flow in. At Countryside Windows, we have a vast array of experience with this sort of installation, so no matter what sort of plot your home sits on and no matter what available space you have, we are able to help you come up with the best solution. 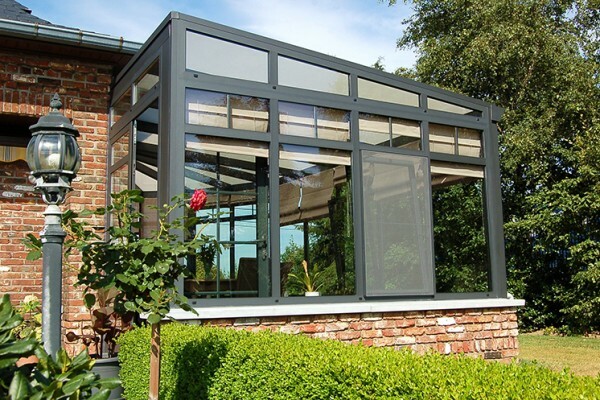 One of the key advantages of an aluminium lean to conservatory is that it can commonly provide a truly modern addition to your home without taking up valuable garden space. For east-west orientated homes, then the possibility of creating a south-facing sun room is often another key decision in choosing this sort of conservatory. With plenty of examples that have been fitted all over the south west of the country, we can help you to choose the right lean to conservatory for your particular needs. Along with the excellent thermal retaining properties of the glazing used in our lean tos, it is important to note that the aluminium structural elements provide a great many plus points, as well. For instance, the aluminium is chosen to provide an excellent amount of durability and strength, but it can also add to the modern look of the overall design. It means that some large glazing panels can be fitted in the walls and the roof to maximise the amount of light that comes in and to afford you the best views over your garden. In addition, aluminium helps to retain heat on the inside of the lean to so that energy costs are kept to a minimum. It is also the ideal material for painting in a selection of differing colours, whether you want it to fit in with your existing window and door frames or to be used to create a contrasting look. Furthermore, aluminium – like the glazing panels – requires virtually no maintenance, once fitted, and a wipe over once in a while is all that is needed to keep your lean to looking immaculate and fresh. With crisp and clear lines, an aluminium lean to conservatory can make all homes appear that much more architecturally pleasing. They are practical but never compromise on style. Just take a look at some of the conservatories we have made to give you a clear picture of the sort of lean tos which are possible today.